For the month of October, my favorite month of crisp, beautiful fall, I am challenging myself to get out my camera every day. And, be intentional to capture some of my favorite things about fall, as well as forcing myself to get creative with my camera. And, while it’s short notice… you’re invited to join me! Each day has a simple, open idea to capture. Really a starting place. You don’t have to be a photographer. Or even own a camera. You just have to have something that takes pictures and be up for some fun. 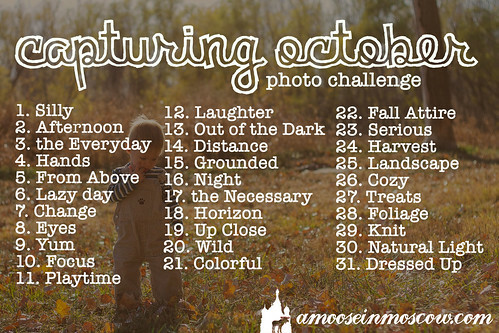 If you have a blog, you can share your photos on there, you can share them on Instagram with #capturingoctober , or on my Facebook page. If you have a blog, I will post a blog roll on my right side bar. So, who wants to join me?